Police officers in the Jewish Quarter of Jerusalem Old City on Monday arrested an East Jerusalem teenage girl found in possession of a knife, on suspicion she was planning to carry out a stabbing attack. This was the second time in two weeks the 15-year-old had been detained for carrying a knife, the police said in a statement. The teenager “raised the suspicions” of police officers in the Jewish Quarter, who called for her to halt. The police initially reported that the knife had been found in the 15-year-old’s purse, but later clarified that it had, in fact, been hidden in her sleeve. As a result, they brought the teen in for questioning. When officers checked the girl’s information, they found that she had been arrested two weeks before, under the same suspicion. The girl, who was not named, was released a few days after her first arrest, when she claimed the knife in her bag was purchased for use in her family’s home. 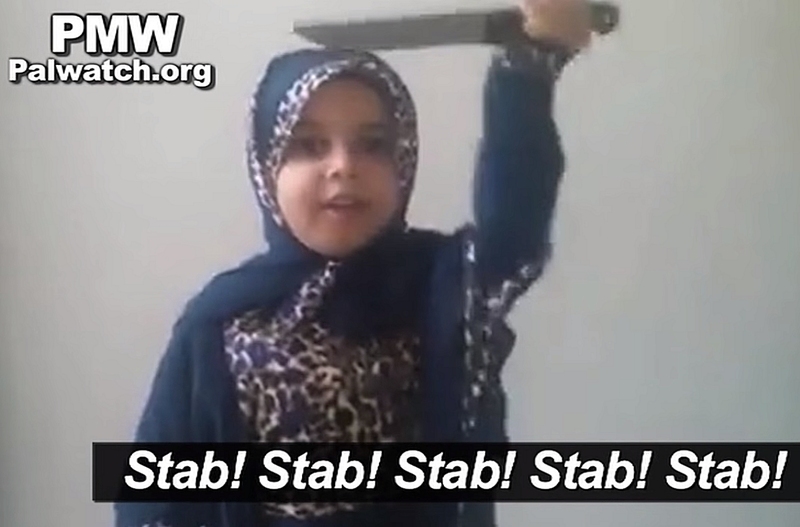 However, police now believe that she was preparing to attack Jewish Israelis. “The way she took out the knife today — and other pieces of information that have been collected — increase the suspicion, and it appears as though the officers prevented the injury of innocent civilians today, thanks to their awareness and sensitivity to aberrations,” the Israel Police said in a statement Monday evening. As we noted here a couple of times in the last week ["14-Dec-15: What do the Palestinian Arabs think?" and "19-Dec-15: Saturday afternoon terror-knifings in Ra'anana"], stabbing attacks on Israelis, a feature of Arab/Jewish co-existence for more than a century, have phenomenal support among today's Palestinian Arab public. They are actively promoted and encouraged (this video for instance) via the Arabic social media, with predictable results. See also "15-Dec-15: Hear about the stabbing in the heart of Jerusalem this afternoon?" and "26-Nov-15: Peering into the darkness, seeing pre-teen children groomed to be ready to die so they can kill" and "23-Nov-15: Central Jerusalem's shuk - two slashers attack and are stopped". No less significant than the stabbings themselves is the utter absence of a response to these sickening illustrations of systemic, society-wide Palestinian Arab child abuse from the well-funded global child-protection and children's rights industries. It's a failure worth pondering as the likes of UNICEF, Defence for Children International, UNESCO, Child Rights International Network, Save the Children and (if you happen to be a government) UNRWA, come to us with their hands open, requesting donations to allow them to keep doing what they do and fail to do.